The 1820s fascinate me as a fashion era, because there is a clear evolution from the beginning of the decade to the end of the decade. In the beginning of the 1820s, the era this dress comes from, the waist was still quite high as you can see from this 1820 fashion plate. By the end of the decade, it has dropped to the natural waist, as you can see from this 1829 fashion plate. The green gown for the B&B series is based off this dress from 1820, though I added the clasp detail on the belt. I love the three-dimensional padded appliques that were a common form of decoration in this era. 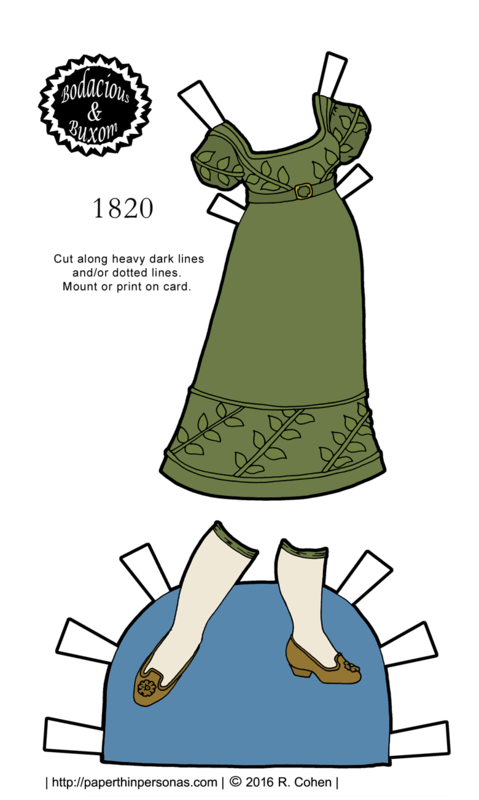 I wanted to make it clear in my paper doll dress from 1820 that the designs were raised. I think that part of it came out well. I did not keep the striped pattern on the original dress. I thought it would be way to hard to not lose the applique leaf pattern if I did that. So, my version is a bit simpler in style. The shoes are based on this pair from the Bata Shoe Museum in Canada. A few other notes about today’s dress. I’m not sure what the formality of a dress like this would have been in 1820. I am included to think it is a formal dress, but not really a ballgown. I think maybe a dinner dress? Something for half-dress, anyway. It’s not as informal as undress and not as formal as full-dress. Any thoughts from y’all? Short sleeves would indicate evening wear after the 1820s, but during the era it is such a transitional period that I am hard pressed to guess exactly what the “rules” were for ladies. As I often say in these situations, I should do more research! Want to support the blog? Then donate and become a Patron, follow the blog on Twitter, leave a comment, and/or tell a friend about it.